What a fun book this is. The plot moves. It twists. What we fear will happen does happen. Then unexpected complications set in. And we end up in a place we never could have imagined. Take this book on a plane. Take it to the beach. But take it with you on a journey that makes you wonder, How much of my life is really mine? Do I control as much of it as I think I do? The book isn’t about fate or destiny. It isn’t about conspiracies either, although powerful players do conspire in this tale. No, it’s about choices—or failing to make them—and the consequences that follow. It’s about how little, innocuous-seeming actions can set momentous change into motion and challenge us as never before. Do we rise to the occasion with resilience and show our grit? Or do we cave? 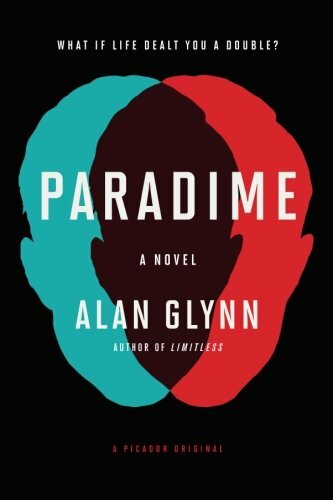 Alan Glynn is known for his thrillers Dark Fields and Limitless (turned into a film with Bradley Cooper). This one opens with Danny Lynch, a civilian cook with PTSD freshly returned from toiling at chow halls in Afghanistan. Back at home he’s a nervous wreck, drifting in a lackadaisical search for work and feeling like he has nowhere to go. Legal action from his former employer suddenly threatens, and just as suddenly a job as a line cook falls into his lap at the Tony Barcadero in midtown. A sight line from Danny’s prep station provides a rare glimpse into the dining room, not all of it but just the prime corner table and the rarefied clientele who conduct business there. As a window onto a lifestyle Danny will never have it’s at least entertainment that breaks the monotony of chopping vegetables all day. Or so it seems until a customer arrives who looks exactly like him. Teddy Trager, the investment mogul who heads Paradime Capital, drips with money, with power, with everything Danny will never have. Each day Trager lunches at the restaurant the more obsessed Danny becomes, until finally he starts trailing his doppelgänger. The action rises. He hocks possessions to buy a cashmere suit and look like a businessman. He stakes out Teddy’s office building, his chauffeur, and eventually is driven to go up to Paradime Capital’s floor and test how well he can pass as the billionaire. Things don’t turn out as planned. He actually gets to be Teddy, an opportunity granted by the forces who have been watching while he has been watching Teddy. But this once-in-a-lifetime chance comes at the price of having to sever all connections with his past life, at which point events really take a turn. Part of what drives the energy in this tale is that Glynn, as before, gives us a character already at the limits of his emotional resilience, on edge and out of grit. And that is where the fun begins.